Elegant and vibrant looking table covers in Indian designs and patterns! They come in vivid colors symbolizing the joie de vivre of life and culture of India. Use them for everyday purposes on your dining table, or special occasions like birthday or wedding anniversary parties. ShalinIndia Tablecloths come in many different sizes in rectangle, square and round shapes. 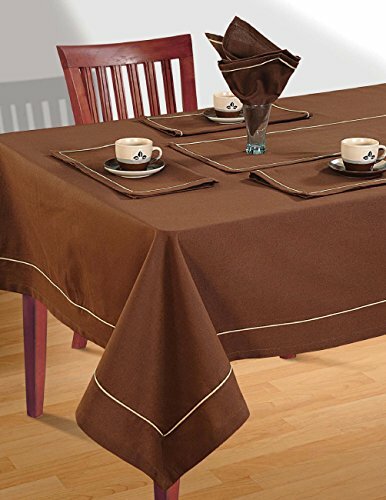 200 thread count cotton fabric imparts a certain robustness to the table cloth to stay firmly on the table. What is even more important, these table covers are easy to maintain. Just machine wash and iron them at home. Color is fast and does not bleed upon washing. Build quality of the cloth is good and will likely last a long time. Color Cinnamon Brown.Fast color.Does not bleed.Machine washable.